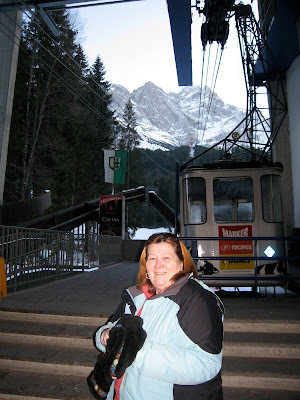 This last week one of the high points (pun intended) of my Germany trip was a gondola ride to the highest point in Germany - the top of the Zugspitze!!! What a journey!! Gorgeous!!! Checked out the map upon entering the gondola area. Yikes, this is the thing I have to ride to reach the top??? - Warning - fear of heights not encouraged here!!! Entrance to the gondola ride- many Asian tourists in Germany - hence the sign. This is the view from the ground - it is a long way up! 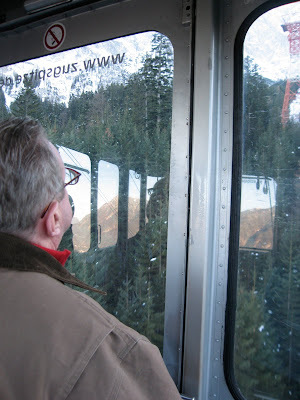 Okay the ride begins- we arrived in the Garmisch area late in the day - so we took the last gondola ride up the mountain- it was about 3:30 pm and we had the gondola to ourselves on the way up! George was fascinated with the car- he kept saying -"Oh that's how James Bond gets out of here"- Fearless!! Passing these large structures was the worse part of the ride- you almost have a feeling of falling for a short time- and the crunching and grinding - OY!!!!! I was scared!!! I am saying - why in the world did I say yes to this!!!!!! YIKES!!!!!! 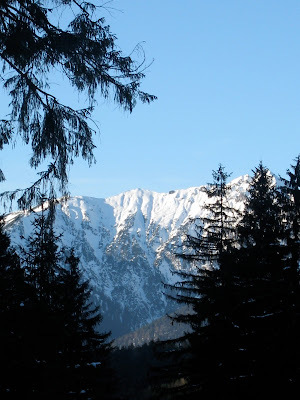 The setting sun - over the Alps- just gorgeous- it was slightly shady on the German side of the mountain. We are getting close to the platform - arriving at the top- almost 3000 feet above sea level!!! Yes - George on the cell- this scene has been repeated all over the world!!!! 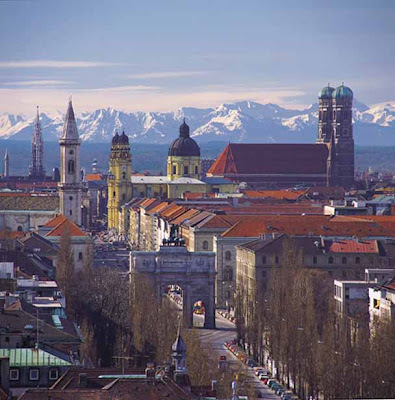 View toward Austria- much sunnier on this side! These pix are all out of the window from the cafe. Completely surrounded with windows the cafe is a great place to view the surrounding mountain ranges!! 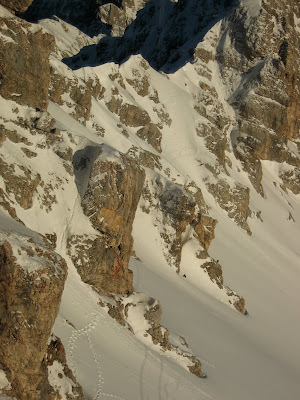 This side of the mountain enables the many skiers to ski on a glacier!!! Unbelievable!!! I really don't think we need any warning signs out there - don't worry I have no intention of going out there!!!!!! The cafe is called 2962- the exact elevation of the mountain. Gotta have a little treat after all that stress in the gondola!!! 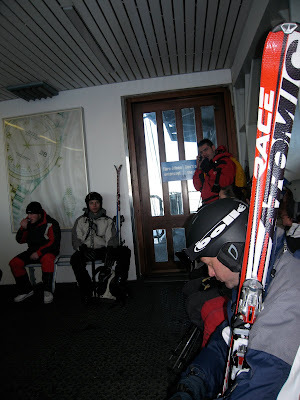 Getting ready to head back down in the gondola with all the skiers- there was no one on the way up but we were packed in with about 25 people and their skis on the way down!!! Heading back to the Lodge- what a day and what a view - even this parting shot is terrific !!!!! More posts on the trip to follow - this however was truly the high point!!!!!!! 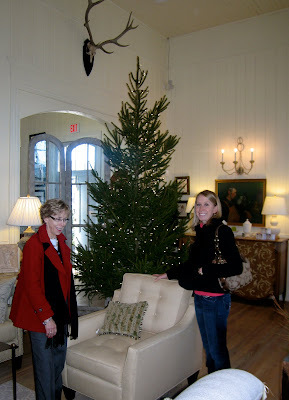 Well what a fun time we had a few weeks before Christmas - Kip, Nan, Nan's daughter Lauren and I ventured out of the city to Upperville, Virginia trying to find this fabulous little gem of a store. 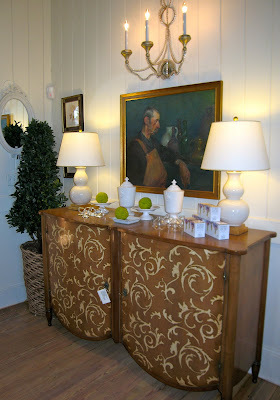 Because of our obsession with blogs especially decorating blogs we were alerted to to this great store. 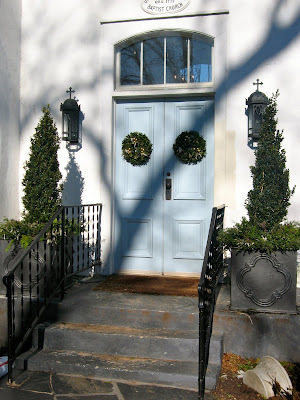 Matthews House and Garden - is an adorable renovated church in Upperville . 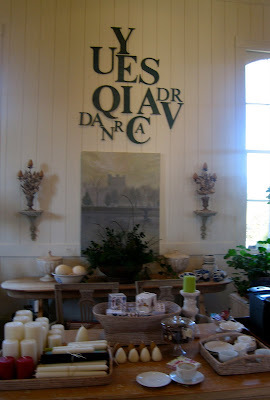 We traveled out from the District through Middleburg and kept on driving - we came upon this charming shop. 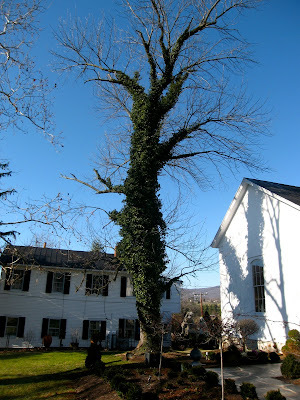 How about this tree- covered in vines next to the shop-creates unbelievable shadows on the shop's main building. English Manor landscaping leads to the front door. 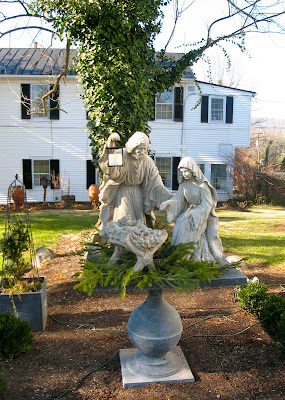 Close up of this statuary nativity scene greeting guests as they make their way up the path to the front door. Other statuary is placed around the shop but this nativity scene really sets the mood for unusual Christmas decorating. 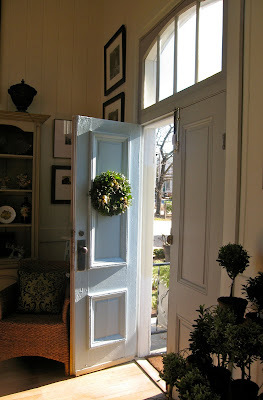 Double front doors adorned in wreaths welcome customers to the shop/church! Love the pastel blue with the white - unexpected. 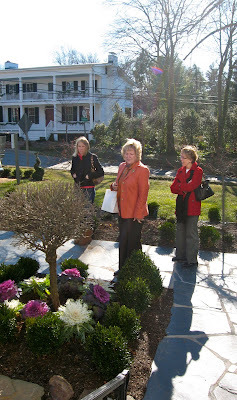 Nan, Kip and Lauren admire the landscaping and use of miniature trees and cabbage - great color for a winter day. 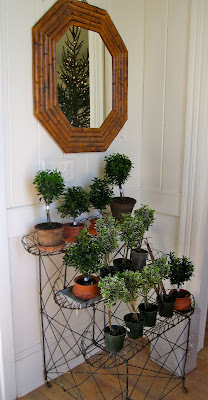 As you enter the shop on the left a beautiful array of herbs and plants on a wire stand. An array of goodies to buy as soon as you walk in! 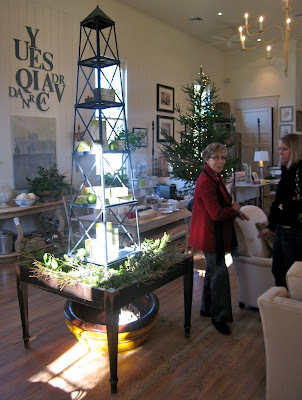 The aroma of evergreen was everywhere- smart marketing as we all bought the Thyme candles fraser fir scent. We were also greeted with "Would you like a cappuccino??" The owner and decorator Wanda Crossley was making her first pot of the day- What a delight she was!!! A big fan of blogs she was so interested in our story and our little blog! Nan and Lauren giggle as I run around and take shots- How beautiful are the trees -simply lit with white lights. 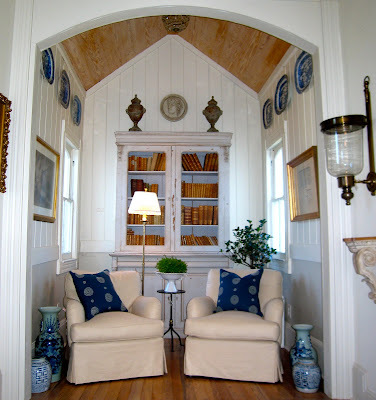 This area of the shop is my favorite- great light and blue and white accessories make this "pulpit" area of the shop just shine! Again the simple trees add a festive touch. I think the wall on the right is bare because Kip bought all 4 of the fabulous sketches that were framed and hanging there. Gorgeous acorn/leaf prints that will look fabulous in her house! You can see in this photo how great the natural light is streaming in the large windows. What a gorgeous piece! 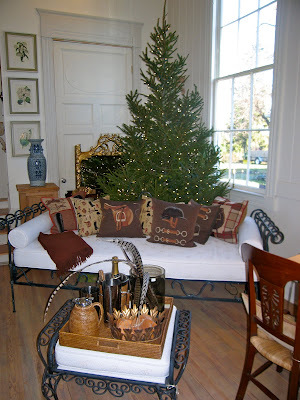 Many light woods and slipcovered pieces are featured at Matthews House and Garden. Wanda told us to check back often as her inventory is always in flux- as soon as Kip bought her prints, Wanda's partner was busily reorganizing and hanging new prints! Fabulous entry as you walk in - what a wall unit - everything looks totally in scale - but this is a huge space! If you are in the area- check it out - you will NOT be dissapointed!!! Also thanks to "My Notting Hill" blog for alerting me to this great store- check out her great photos and insights!